Okay, if it’s this cold outside in Auckland, I’m gonna go ahead and assume that everywhere south of here the people are mostly dead. We woke to fresh snow on the Kakanuis this morning and a light frost but, as often happens with a frost in the south, we also got a cloudless sky and bright sun. It was still a little chilly outside but nothing an extra layer of merino couldn’t counter and for that I’m grateful. Crepuscular – of, resembling or relating to twilight; appearing or active in the twilight or just before dawn when the light is dim. Southern mayors are asking people to join an e-mob today to save Roxburgh children’s village. Message from Central Otago Mayor Tim Cadogan: the people of the South are being asked to join in an e-mob protest (possibly the first of its kind) to get the message that failing to increase funding so the Roxburgh Children’s Village can remain operating is unacceptable to the people of the South. Those who care about the Village and the children and families of the South that have used its services since 1949 are asked to join an “e-mob” protest, sending the very poignant Garrick Tremain cartoon (with his permission) to Jacinda Ardern this Tuesday 29 May. May 29 has been chosen as it is one month until the doors close on the Village. It is very important that you know that the residential therapeutic service that the Village offers will no longer be available to the children of the South, while it does remain in place for other parts of New Zealand. This is service by geography at its worst. May 29 is also the anniversary of Mabel Howard being made our first female Cabinet Minister in 1949. Ironically, she was made Minister of Health and Children’s Welfare. Everyone who sends the cartoon is asked to email: roxburroxburghletsnotdothis@gmail.com so an accurate count of support can be made. The ODT answers questions about the village and the service it provides for children in desperate need here. Prime Minister Jacinda Ardern and Agriculture and Biosecurity Minister Damien O’Connor say we have one shot at eradicating a disease that causes painful, untreatable illness in cattle. The decision was taken collectively by Government and farming sector bodies after months of intense modelling and analysis to understand the likely impacts of the disease, the potential spread and the costs and benefits of eradication versus other actions. . .
Today’s decision of phased eradication over two years of the cattle disease Mycoplasma Bovis will bring a significant level of certainty to the farmers around the country, National’s Agriculture Spokesperson Nathan Guy says. “I’m pleased a decision has finally been made and that an agreement has also been struck to share the costs of this response between industry and Government,” Mr Guy says. “This disease has caused enormous stress and anxiety for farming families. The financial and emotional toll on farmers has been significant and the Rural Support Trust has done an outstanding job supporting those in need. . . There is no doubt the decision announced today to continue to attempt to eradicate Mycoplasma bovis from New Zealand is going to cause pain and anguish for more farmers, Federated Farmers president Katie Milne says. Federated Farmers believes getting rid of this insidious disease is preferable to living with it, for years on end, probably without any compensation available for farmers in future when it does hit and can’t be controlled. . . 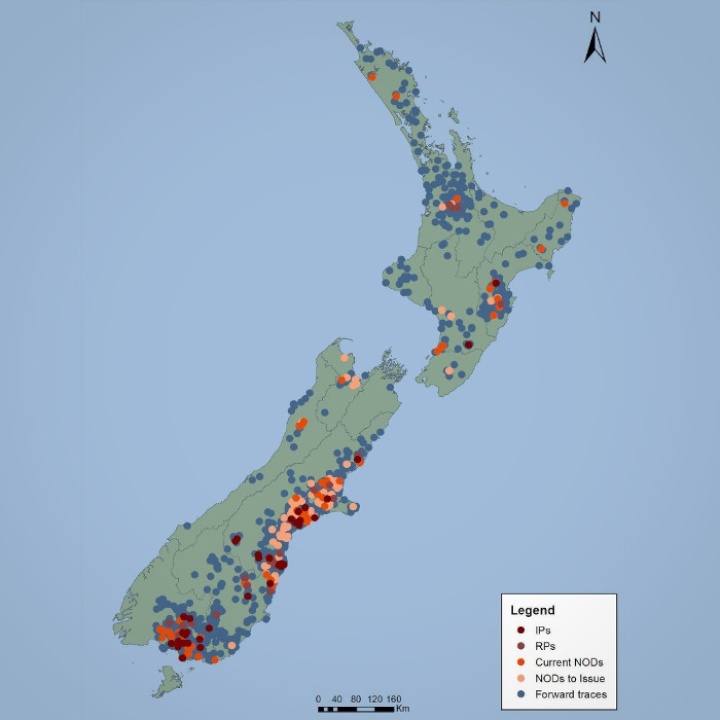 Beef + Lamb New Zealand (B+LNZ) supports the decision announced by the Government to attempt phased eradication of Mycoplasma bovis (Mp. bovis) from New Zealand. “This has been a difficult decision to reach, and we acknowledge that it won’t please all farmers,” says B+LNZ Chairman Andrew Morrison. “As a Southland farmer near to one of the epicentres, I am well aware of the impact of this response on farmers, their families and our communities. . .
As a veterinarian working on the foot and mouth response in the UK, I’ve seen the misery that outbreaks of serious infectious diseases can bring down on the agricultural sector – animals, farmers and their communities. Containing these outbreaks always involves hard choices and significant consequences – there are seldom any easy solutions. So, I don’t envy the government ministers who will make the call on how New Zealand will respond to the Mycoplasma bovis (M bovis) outbreak. They have to choose between trying to eradicate the disease or accepting that it has taken hold in New Zealand and opting to manage it. M bovis is a tricky disease and whatever option is chosen, it will not be easy to tame. Which ever way the decision goes, there will be no going back to business-as-usual on farms. . .
Oamaru Intermediate School (OIS) went to the dogs last week — with a few sheep thrown in as well. The school’s 280 pupils visited Fraser Farm, at Waitaki Boys’ High School, as part of the Agrication project. It aimed to put pupils from 100 schools on to sheep and beef farms and, over the past two weeks, 1100 children had been on farms nationally. Funded by the Red Meat Profit Partnership and delivered by New Zealand Young Farmers’ school engagement team, the aim was to help pupils and teachers understand the wealth of career opportunities available in the agri-food sector. . . The offer of 1.8 million free manuka seedlings by Te Uru Rakau (Forestry New Zealand) in partnership with Manuka Farming New Zealand has proved hugely popular with applications totaling 5.2 million seedlings. Manuka Farming New Zealand (MFNZ) General Manager Stephen Lee says they were overwhelmed by the huge interest for the seedlings. The initiative contributes to the Government’s One Billion Trees Programme. “We had 1.8 million manuka trees available, which would cover about 1,635 hectares in plantings across New Zealand. Within a week we had 70 applications, totaling 3.6 million seedlings, and covering around 2,841 hectares. . .
(BusinessDesk) – First NZ Capital has cut its rating on Fonterra Shareholders’ Fund units as the dairy cooperative’s seeming inability to convert capital investment into earnings growth and poor track record in adding value raises questions over its ability to retain domestic suppliers. Analyst Arie Dekker lowered his rating on the units, which give investors exposure to Fonterra Cooperative Group’s earnings, to ‘underperform’ from neutral, and sliced 17 percent from his target price to $5.09. The units recently rose 0.9 percent to $5.38. . .
Ballance Agri-Nutrients, in partnership with leading SAP and technologies provider Soltius, has won a prestigious global award for its new omni-channel farm management system, MyBallance. MyBallance – “your farm at your fingertips” – connects multiple data sources to provide real time information and analytics to Ballance customers across all devices; helping inform on-farm decision making as well as simplifying business processes. The digital solution, which leverages multiple SAP HANA applications, stood out amongst 170 entries to win the Best Run Award at the SAP Innovation Awards 2018. . .
New independent research findings continue to highlight the nitrogen mitigating effects of Ecotain environmental plantain, with one study showing it halved the concentration of urinary nitrogen in cows. In September 2017, proprietary seed company Agricom announced major research findings that showed Ecotain can significantly reduce nitrogen leaching from urine patches on livestock farms. Most nitrogen leaching from livestock farms comes from the urine patch, an area containing high concentrations of nitrogen from animals’ urine. Agricom’s lead scientist Dr Glenn Judson says the new independent research findings, which have come from several post-graduate students’ PhD theses, continue to demonstrate the benefits of Ecotain. . .
One of New Zealand’s foremost breeding studs has begun selling some of its land as a residential subdivision – supplying the high demand in and around Cambridge for large quality sections. The land now encompassed by the Oaks Stud has been the home of legendary mare Sunline who won $13 million in prize money during his illustrious 32 win career in the 1990’s. The Oaks Stud also produced New Zealand’s Horse of the Year, Seachange, who won a world title along with $1.7 million in prize money. . . Gypsy gold doesn’t chink and glitter. It gleams in the sun and neighs in the dark. Poets have been mysteriously silent on the subject of cheese. – G. K. Chesterton who was born on this day in 1874. 363 Roman Emperor Julian defeated the Sassanid army in the Battle of Ctesiphon, under the walls of the Sassanid capital, but was unable to take the city. 1167 Battle of Monte Porzio – A Roman army supporting Pope Alexander III was defeated by Christian of Buch and Rainald of Dassel. 1176 Battle of Legnano: The Lombard League defeated Emperor Frederick I. 1630 Charles II of England was born (d. 1685). 1453 Byzantine-Ottoman Wars: Ottoman armies under Sultan Mehmed IIFatih sacked and captured Constantinople after a siege, ending the Byzantine Empire. 1660 English Restoration: Charles II (on his birthday) was restored to the throne of Great Britain. 1677 Treaty of Middle Plantation established peace between the Virginia colonists and the local Natives. 1727 Peter II became Tsar of Russia. 1733 The right of Canadians to keep Indian slaves was upheld. 1780 American Revolutionary War: At the Battle of Waxhaws Lieutenant Colonel Banastre Tarleton massacred Colonel Abraham Buford’s continentals. 1790 Rhode Island became the last of the original United States‘ colonies to ratify the Constitution and was admitted as the 13th U.S. state. 1848 Wisconsin was admitted as the 30th U.S. state. 1864 Emperor Maximilian of Mexico arrived in Mexico for the first time. 1867 The Austro-Hungarian agreement – Ausgleich (“the Compromise“) – was born through Act 12, which established the Austro-Hungarian Empire. 1868 The assassination of Michael Obrenovich III, Prince of Serbia. 1874 G. K. Chesterton, English novelist, was born (d. 1936). 1886 Chemist John Pemberton placed his first advertisement for Coca-Cola, it appeared in the Atlanta Journal. 1900 – N’Djamena was founded as Fort-Lamy by French commanderÉmile Gentil. 1903 Bob Hope, British-born comedian and actor, was born (d. 2003). 1903 May coup d’etat: Alexander Obrenovich, King of Serbia, and Queen Draga, were assassinated in Belgrade by the Black Hand (Crna Ruka) organization. 1906 T.H. White, British author, was born (d. 1964). 1913 Igor Stravinsky‘s ballet score The Rite of Spring received its premiere performance in Paris, provoking a riot. 1914 – Tenzing Norgay, Nepalese-Indian mountaineer, was born, (d. 1986). 1914 Ocean liner RMS Empress of Ireland sank in the Gulf of St. Lawrence with the loss of 1,024 lives. 1917 – John F. Kennedy, 35th President of the United States, was born (d. 1963). 1919 – Einstein’s theory of general relativity was tested (later confirmed) by Arthur Eddington’s observation of a total solar eclipse in Principe and by Andrew Crommelin in Sobral, Ceará, Brazil. 1919 The Republic of Prekmurje founded. 1924 AEK Athens FC was established on the anniversary of the siege ofConstantinople by the Turks. 1935 The Hoover Dam was completed. 1939 Albanian fascist leader Tefik Mborja is appointed as member of the Italian Chamber of Fasces and Corporations. 1940 The first flight of the F4U Corsair. 1941 Doug Scott, British mountaineer, was born. 1942 Bing Crosby, the Ken Darby Singers and the John Scott Trotter Orchestra recorded Irving Berlin’s “White Christmas”. 1945 Gary Brooker, musician (Procol Harum), was born. 1945 First combat mission of the Consolidated B-32 Dominator heavy bomber. 1947 – Mabel Howard became New Zealand’s first female Cabinet Minister. 1950 The St. Roch, the first ship to circumnavigate North America, arrived in Halifax, Nova Scotia . 1953 Edmund Hillary and Sherpa Tenzing Norgay became the first people to reach the summit of Mount Everest, on Tenzing Norgay’s (adopted) 39th birthday. 1954 First of the annual Bilderberg conferences. 1959 Rupert Everett, English actor, was born. 1961 Melissa Etheridge, American musician, was born. 1963 Tracey E. Bregman, American actress, was born. 1967 Noel Gallagher, English musician (former Oasis), was born. 1969 General strike in Córdoba, Argentina, leading to the Cordobazo civil unrest. 1973 Tom Bradley was elected the first black mayor of Los Angeles. 1975 Melanie Brown, English musician and actress (Spice Girls), was born. 1978 Adam Rickitt, British actor, was born. 1982 – Pope John Paul II became the first pontiff to visit Canterbury Cathedral. 1985 – Heysel Stadium disaster: At the European Cup final in Brussels 39 football fans died and hundreds are injured when a dilapidated retaining wall collapses after Liverpool F.C. fans breached a fence separating them from Juventus F.C. fans. 1985 Amputee Steve Fonyo completed cross-Canada marathonatVictoria, British Columbia, after 14 months. 1988 U.S. President Ronald Reagan began his first visit to the Soviet Union. 1990 The Russian parliament elected Boris Yeltsin president of the Russian SFSR. 1999 Olusegun Obasanjo took office as President of Nigeria, the first elected and civilian head of state in Nigeria after 16 years of military rule. 1999 Space Shuttle Discovery completed the first docking with theInternational Space Station. 1999 – Charlotte Perrelli won the Eurovision Song Contest 1999 for Sweden with the song Take Me to Your Heaven. 2001 U.S. Supreme Court ruled that disabled golfer Casey Martin could use a cart to ride in at tournaments. 2004 The National World War II Memorial was dedicated in Washington, D.C.
2008 – A strong earthquake measuring 6.1 on the Richter scale struck Iceland near the town of Selfoss, injuring 30 people. 2012 – A 5.8-magnitude earthquake hit northern Italy near Bologna, killing at least 24 people. 2014 – Ignatius Aphrem II was enthroned as the Syriac OrthodoxPatriarch of Antioch. You are currently browsing the Homepaddock blog archives for the day Tuesday, May 29th, 2018.